Letters and artwork by killer Reggie Kray are being auctioned by the woman credited with helping him become a born-again Christian. Carol-Ann Kelly struck up an friendship with the East End villain while visiting her then husband in Parkhurst prison on the Isle of Wight in 1983. 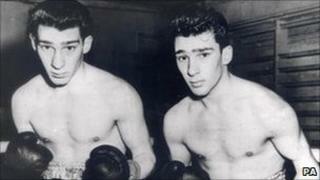 The pair became close after Kray, who died of cancer in 2000, said she reminded him of his late wife. The lot could fetch £2,000 when auctioned at Lewes, East Sussex. The previously unseen letters were written in the 1980s when Kray was part-way through a life term for the murder of Jack "The Hat" McVitie. Ms Kelly, of north-west London, maintained contact with Kray through prison visits, letters and phone calls from 1983 to 1989 but insisted it was strictly platonic. One letter revealed his battle with the Parole Board to secure a move to Maidstone prison. He wrote: "I feel my reputation is stopping them from accepting. "I am not a nutcase. I'm quite stable in myself. "I'm going to point out that I would even forgo visits to Ron. Then they have no reason not to release me." The villain was so fond of Ms Kelly that she said he even paid for the rent on a flat on the Isle of Wight so she could visit him in prison with her then eight-year-old son David. But in the collection, he shows apparent sincerity in his actions, according to Ms Kelly. Writing to her after the breakdown of her marriage, he told her: "Get your head together. Don't contemplate suicide. Ms Kelly, now in her 50s, said she never saw Reggie Kray as the man considered, along with his twin Ronnie, to be one of the foremost perpetrators of organised crime in the East End in the 1950s and 1960s. "He didn't look like the monster he had been made out to be," she said. "He said he had done some horrible, wicked things and he said he knew he'd probably die in prison. "He really wanted to get out and speak to the media because he didn't want the next generation to be going round with guns, which is what's happening now." As well as letters, Kray also sent a signed oil painting of a boxer to her son and a coloured pencil sketch of himself as a cowboy. The lot is set to go under the hammer at Gorringes Auctioneers on 9 February, with proceeds being donated to the Royal Free Hospital in Hampstead. Gorringes auctioneer and valuer Aaron Dean said there was an unending fascination with the Kray twins. "They have an everlasting legacy, it seems, because they are in the living memory of a large part of the British public," he said. "This sale represents yet another side to the Krays' saga and how they came to regret the actions of their youthful past."